If you listen to any console PR man at the moment, no doubt part of his spiel is something to do with DVR. “Record your games and share your precious moments on the internets!” he may say. It’s something we’ve been doing on the PC for years thanks to Fraps, but the whole mechanic of the system constantly recording your last 5 minutes of game so you can instantly upload without pre-planning is pretty neat. Of course, if it can be done on console, it can be done on PC. Enter ShadowPlay. 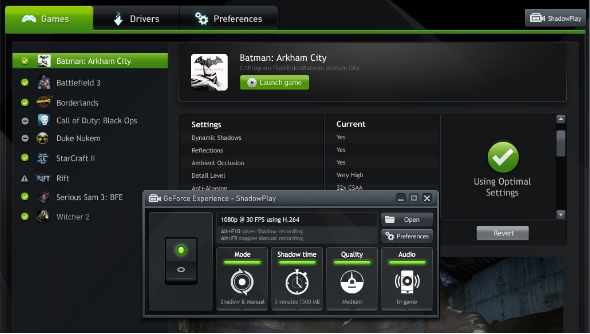 ShadowPlay is a new software from Nvidia that offers gameplay recording using the H.264 encoder built into GeForce GTX 600 and 700 GPUs. ShadowPlay’s key feature is the Shadow Mode, which allows you to constantly record the last ten to twenty minutes of gameplay, available for instant saving whenever you demand. The footage itself is saved to a temporary buffer, and made into a permanent file only when you press the hotkey. Then simply hop out of the game and upload that file to YouTube, and you’ve got your best Battlefield kill online in mere minutes. The software will also work like more traditional recording software, with manual start/stop hotkeys for a more orchestrated capture session. Nvidia have also partnered up with Twitch, meaning ShadowPlay will be able to beam your gameplay footage directly to Twitch.tv for others to watch in real time. GeForce ShadowPlay enters beta on October 28th, and will be available to download from GeForce.com. You’ll need to be running a GeForce GTX 650 under the hood or something better. And sorry AMD users, but that Radeon won’t be seeing any of the action.